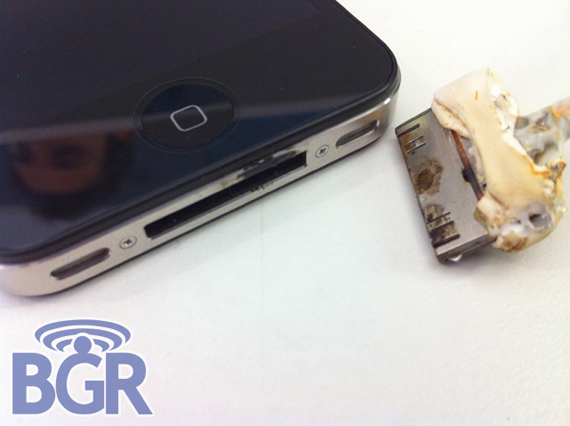 A brand new iPhone 4 was burnt partially while recharging. On one hand where people are maniacally buying the Apples latest edition, leaving all the stores out of stock, comes a news saying an i4 catching fire and causing minute yet significant burn injuries to its owner. The incident which was reported by the blog Boy Genius is reported by an AT&T source. The Brand new gadget caught fire while it was kept on charging with a computer through Apple USB cable that comes with the device. When asked for a non charged exchange of the handset the Apple told the store that there was no such fault with the gadget which can cause a fire instead the USB cable was faulty. This incident is not something new as there have been many such cases of overheating or burning even exploding of the apple iPods, phones and other gadgets in past, because of which apple is already facing many lawsuits. If we talk about the i4, first came the news of its poor network connectivity then bad functioning and now the Phone catching fire due to overheating, but still it is always out of stock. A little suggestion for Apple, they should specifically give a warning notice on all its products, “our products are highly combustible buy them on your own risk”. People need to be aware of one big fact that safety comes first and then comes the style so kindly go through the flaws and then purchase an electronic gadget as we don’t want any such accidents to happen to you, and about Apple well I think its PRO will definitely be taking conditions under control.